Milwaukee’s topography of rivers, valleys, and high bluffs created significant transportation challenges. Engineers in Milwaukee constructed bridges to allow vehicles and pedestrians to cross over waterways, while viaducts directed traffic across changes in terrain. During the late nineteenth century, innovations in iron and steel construction allowed viaducts to cover greater distances with multiple spans and at higher heights. 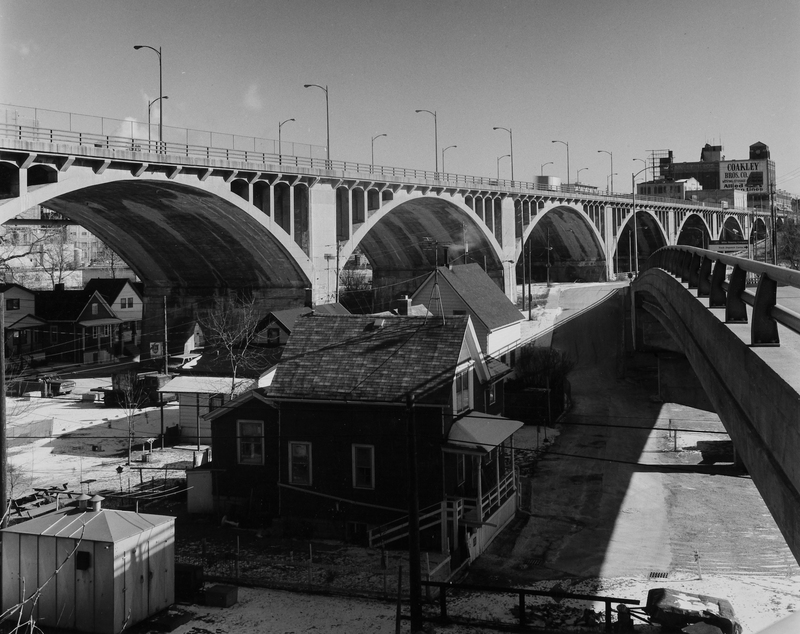 Between 1878 and 1933, eight key viaduct sites were established in Milwaukee. Tracing their development helps show growth of parts of the city. In 1878, the site near Sixth Street was selected for the first extended Menomonee Valley crossing to Walker’s Point. In 1908, the first bridges were replaced by the Sixth Street Viaduct, which lasted for nearly a century. It was replaced in 2002 with north and south end cable-stayed and bascule bridges with a ground-level road in the middle. After a century of shuttling traffic over the Menomonee Valley, the modern Sixth Street Viaduct reopened direct access to the Valley at Canal Street. In 1880s, Sixteenth Street became the site of a second viaduct. Completed in 1894, the original iron structure was reinforced to accommodate the addition of streetcars in 1911. The 1929 replacement viaduct was updated in the twenty-first century for easy access to the Potawatomi Casino and Marquette University’s athletic Valley Fields below. Beginning in August 1967, Father James Groppi led open housing marchers across the Sixteenth Street Viaduct, where they encountered violent protesters. In 1988, it was renamed the James E. Groppi Unity Bridge. In 1909, a third viaduct was added across the Menomonee Valley at Twenty-Seventh Street. This steel frame and concrete structure featured brick paving and streetcar service. It provided access to picturesque Mitchell Park and the developing neighborhood of Layton Park. The viaduct was replaced twice, in 1929 and in 1981. 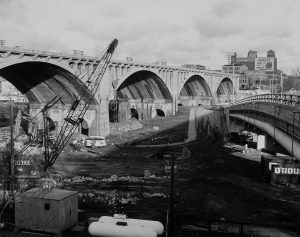 By 1933, a fourth viaduct was needed at Thirty-Fifth Street, as the neighborhoods expanded south and west. In 1976, the structure was widened and reinforced. Good views of the Twenty-Seventh and Thirty-Fifth Street viaducts are available from Three Bridges Park. Further north and connecting west, in 1911, the Grand Avenue (now Wisconsin Avenue) Viaduct was completed over the Menomonee River and the Piggsville neighborhood. The winning design from a national competition used concrete reinforced steel beams to support Art Deco barrel vaulted arches. Residential subdivisions to the west, such as Story Hill, soon expanded. The 1993 replacement viaduct has a streamlined arched design. In 1909, a Highland Boulevard Viaduct was built to carry traffic over the rail yards and valley west into the newly opened area of Washington Park. The 2009 replacement retained some of the original arched features. Since 1892, street car passengers traversed the Menomonee Valley on a narrow iron truss viaduct on Wells Street. It was demolished in 1958. On the east side of downtown, in 1921, the North Avenue Viaduct with neoclassical ornamentation was built to provide important access over the Milwaukee River. It was replaced in 1991. In 1926, the Holton Street Viaduct was built to connect the top of the Milwaukee River bluff to Brady Street. In 2005, a Marsupial Bridge was added under the viaduct to encourage pedestrian and bicycle use. ^ Many people use the terms “bridge” and “viaduct” interchangeably. A viaduct is a kind of bridge, usually formed of multiple arches and traversing land, such as the uneven terrain described in this entry. See Viaducts—Viaduct vs. Bridge, History of Bridges website, accessed September 3, 2017. ^ John Gurda, Milwaukee: City of Neighborhoods (Milwaukee: Historic Milwaukee, Inc. 2015), 37. ^ Becca Mader, “Sixth Street Viaduct Is Model of New Bridge Technology,” Milwaukee Business Journal, last modified March 24, 2002, last accessed September 3, 2017. ^ “Milwaukee’s Bridges and Their Interesting History,” Milwaukee Daily News; Milwaukee, WI, November 1, 1913; Wisconsin Historical Society website, accessed http//:www.wisconsinhistory.org on January 29, 2016, now available at https://www.wisconsinhistory.org/Records/Newspaper/BA11652, last accessed September 7, 2017. ^ Gurda, Milwaukee, 358, 394. ^ “27th Street Viaduct, Milwaukee County, WI,” last modified July, 15, 2008, Historic and Notable Bridges of the U.S., Bridgehunter.com, accessed on January 30, 2016. ^ Historic American Engineering Record, “Grand Avenue Viaduct, Milwaukee County, WI,” Historic and Notable Bridges of the U.S., Bridgehunter.com, accessed January 30, 2016. ^ “Highland Boulevard Viaduct, Milwaukee County, WI,” last modified July 11, 2011, Historic and Notable Bridges of the U.S., Bridgehunter.com, accessed January 30, 2016. ^ Gurda, Milwaukee, 98; “North Avenue Viaduct, Milwaukee County, WI,” last modified April 16, 2010, Historic and Notable Bridges of the U.S., Bridgehunter.com accessed January 30, 2016. 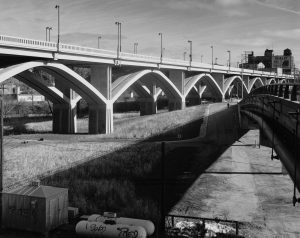 ^ “Holton Avenue Viaduct, Milwaukee County, WI,” last modified September 26, 2013, Historic and Notable Bridges of the U.S., Bridgehunter.com, accessed January 30, 2016. Gurda, John. Milwaukee: City of Neighborhoods. Milwaukee: Historic Milwaukee, Inc., Milwaukee, 2015.